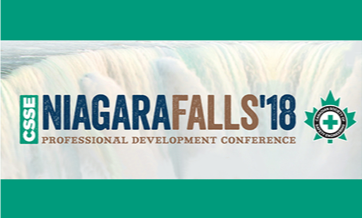 Tavares Group Consulting to return to CSSE Professional Development Conference in 2018 - Tavares Group Consulting Inc.
Tavares Group Consulting is thrilled to participate at the Canadian Society of Safety Engineering (CSSE) 2018 Professional Development Conference (PDC) & Exhibition, which takes place September 16th-19th in Niagara Falls, Ontario. This year’s theme is “People, Purpose & Passion: The Pathway to OHS Success” and takes place over the 3-day conference and trade show annually in September. This noteworthy event allows occupational healthy and safety professionals from various industries to come together in order to gain insight on the leading health, safety and environmental products and services that can be applied in the workplace. In early 2015 Tavares Group Consulting was engaged by CSSE for a safety sustainability project aimed at developing an action plan and strategy for the integration of safety sustainability into the larger sustainability movement. By Fall 2015, Tavares Group Consulting spoke at the 2015 CSSE Professional Development Conference with The Works Design Communication Ltd. to unveil the Safety Sustainability Strategic Action Plan that had been developed for CSSE members. The CSSE’s Safety Sustainability Strategic Action Plan was developed using the Sustainability Toolkit as its foundation, offering a systems approach to sustainability implementation. Fast-forward to 2018, Tavares Group Consulting has now developed a sustainability management and reporting software, StaarsoftTM, which is also founded on the Sustainability Toolkit approach. StaarsoftTM guides organizations, step-by-step through the process of planning, implementing, and continually improving a comprehensive sustainability program. Visit us at booth #62 to see a demonstration of StaarsoftTM.